listclean - Data Cleaning for lists of Companies/Contacts etc..
Is your marketing data dirty? are you sending the same marketing emails to the same person more than once? are you telephoning the same person multiple times for the same reason? are you sending marketing emails to non-existent email addresses? If so you could benefit from using listclean. Improve your new lead hit rate and save money on your costs. listclean can clean, i.e. 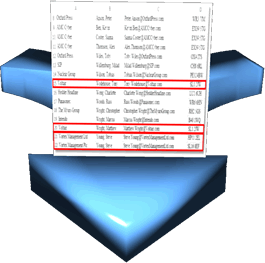 deduplicate, flat lists such as lists of accounts and contacts. It is optimised to clean Marketing Data lists with specific handling of Company Names and Personal Names but it can handle any type of data. listclean can clean, i.e. 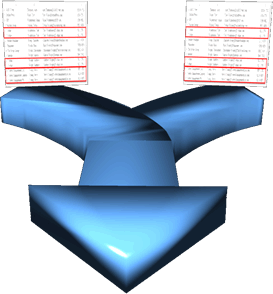 deduplicate, hierarchical lists such as lists of both accounts and contacts. It is optimised to clean Marketing Data lists with specific handling of Company Names and Personal Names but it can handle any type of hierarchical data to any depth. listclean requires the data as either an excel spreadsheet file or as a csv (comma separated value) file. You can make changes to the uploaded file using a familiar excel-like interface and download the cleansed data in several different file formats including, excel speadsheet, csv and pdf. Prices are £5 per 5000 rows, for either deduplication or email address checking. You can pay to clean an individual list and you will only be asked to pay, using PayPal, when you are satisfied with the cleansed list and want to download the results. The amount you will need to pay is dependant on the number of rows in the original data and if you have chosen to check your email addresses, on the number of addresses checked. Prices are £35 per month, with discounts for longer periods. You can subscribe to listclean to clean as many lists as you want up to 100,000 rows per list, including checking any email addresses. You can unsubscribe at any time you want. Prices are from £25 per user per month. marketing automation, including web site landing pages. a full set of reporting tools. You make the final decision when merging records as to which fields from each duplicate should be the master using a simple user interface. I found it very easy to use listclean to clean my very dirty data I had inherited. I would recommend listclean wholeheartedly. I was surprised how many duplicates it found in my marketing lists. I had not realised how dirty my data was.